In his first decade at Eastman, Harold Gleason (1892-1980) maintained a schedule that seemed to leave little time for students. Almost simultaneously, he was George Eastman’s personal organist and director of music at Eastman’s home, founder and director of the David Hochstein Memorial Music School, first head of the organ department at the Eastman School, and an organist and director of music at several Rochester churches, as well as a touring recitalist. As head of the graduate division at Eastman from 1932 until his retirement in 1955, Mr. Gleason was instrumental in the development of the School’s DMA degree program. During his career as organist and teacher, he also wrote Method of Organ Playing, a book that many considered the best instructional manual available, as well as two anthologies: Outlines of Music Literature, and Examples of Music before 1400. He also co-authored the Anthology of Music in America, 1620-1865. 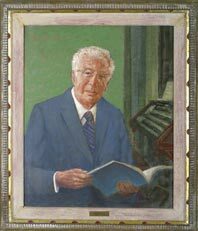 Mr. Gleason not only played, taught, and wrote about the organ, but also designed pipe organs as well. The organs in Kilbourn Hall and in Strong Auditorium on the University’s River Campus were built to his specifications.